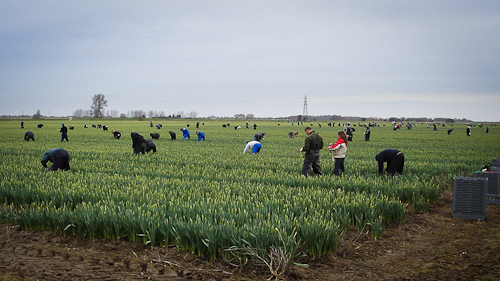 We are cropping daffodils today; we have about 160 people cropping; mostly they are from Lithuania but around forty people are English as there is still a strong tradition of land work in and around Boston. For many of the croppers daffodils are the first job since Christmas so it needs to be a good one! It is piecework, the crop is good and the croppers will earn between £70 and £140 a day so they go home tired and happy as will our regular staff I hope. It is just about the only hard physical work on the farm these days. The temperature will probably get to 15 degrees today with warm nights and the crop is racing along so we will be working over the weekend. This could be a worry that there will be too many flowers for the demand but so far so good. Our customer has found another 140 million potential customers in Russia this year although I don’t suppose we will be delivering to Vladivostok. Scandinavia is a traditionally good market for us, their daffodils are weeks away yet. Whilst the flower market is buzzing, the market for the bulbs is less so. Daffs in the garden seem to be less fashionable for some reason and I will return to that another time. We will be selling bulbs direct again this year so if anyone wants to register their interest, do so by email (robin@jackbuck.co.uk) and we will get back to you in August. Daffodil bulbs contain a chemical called galanthamine that pharmaceutical companies have been extracting for use in treatment of Alzheimers disease and of course I am hoping that a little bit of that galanthamine is volatile and wafts about around a vase of daffies. Now wouldn’t that be a terrific U.S.P. So far so good for me, although my wife might not agree.